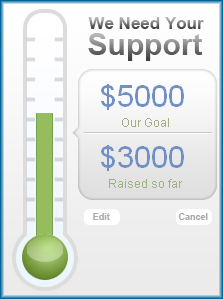 Want to learn how to create a Fundraising Thermometer to display your campaign progress. It's quite a simple thing to do. There are also quite a few fundraisers and fundraising resources that automatically create a thermometer for you which we'll touch on below. As I mentioned up above there are a few fundraisers that will automatically create a fundraising thermometer for your campaign. If you are planning to use one of these fundraisers, then you won't need to create a thermometer, unless of course, you also want to display your thermometer somewhere other than your campaign page. That doesn't apply to the first example below though, as you can create a widget (Charity Badge) from your campaign page to place elsewhere, that will display your Thermometer. The Online Donations / Crowdfunding fundraiser through a recommended Crowdfunding/Donation Website like this one. BonfireFunds' Online T Shirt Fundraiser is another brilliant, yet unusual, fundraising idea that uses a Thermometer to display your fundraising progress! GA Fundraising's Online Fundraiser - Selling magazines and other fundraising products. Just like BonfireFunds, it provides a Thermometer for multiple participants. So Where Can You Create It? But I personally find that the site that offers the best fundraising Thermometers is DoJiggy! Whether you just add a donation service to your site or use their advanced pledge services, their Thermometers are simple, effective and look great. Click the link to read up about their Thermometer. Check out the AccessAbility donation page here. Check out the "St Thomas More Catholic School Rock 'N Run" pledge fundraising page here. I encourage you to be creative with this! Think of a type of thermometer you can create that will catch people's attention? How can you link it to your cause? Etc. For example: If you are fundraising for a new building you could maybe use images of bricks to show your progress. Each $50 raised adds another brick to the thermometer! Get the idea?! For some simple printable Thermometers I would recommend you look through these Thermometer Templates. You should always view your thermometer as a way of encouraging people to support and motivation for your fundraising team. Use it in a way that catches attention. Place it in, or on, high traffic areas. Place it where your fundraising team will see it often (at least every day)! Always include info on how to support your cause on, or near to the thermometer! For some more tips like setting a goal for your fundraiser thermometer read here.